Today we are going to take a look at writing challenges in general, like InCoWriMo, (who comes up with these acronyms anyway??) or Month of Letters. 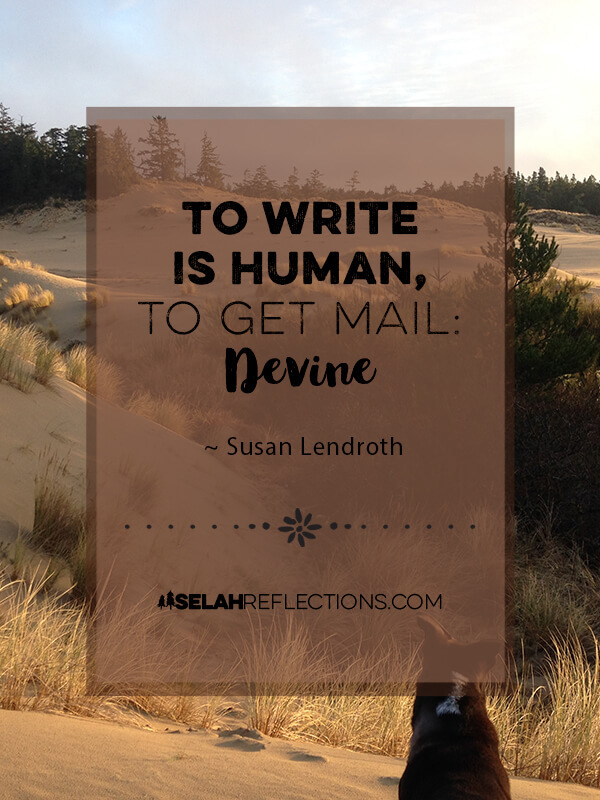 Quick note – at the bottom of this post, I’ve made a list with links to some of the most popular letter writing challenges. If you’ve been with me for awhile, you know that I love and collect handwritten letters. These are gifts of someone’s time and effort and have a lot of meaning for me. I’ve saved many from my Grandma’s, Aunts, Great Aunts, Parents, Siblings, and friends since childhood. It is one of my favorite collections and brings back so many memories when I look through them. Depending on the letter writing challenge you follow, the idea is usually to write and mail at least one card, letter, or postcard a day for a month. The ideas and the creativity around these challenges is nothing short of spectacular! I can get so excited over the prospect and want to pull out all my cards, favorite pens, paper, wax stamps, stickers and whatever else I can think of to dive in and get started. Then reality hits and there is absolutely NO WAY I can handle a challenge of this magnitude right now, no matter how much I would like to. Someday maybe, but for now I can’t. So I’ve decided to take the challenge and tweak it to make it work for me. 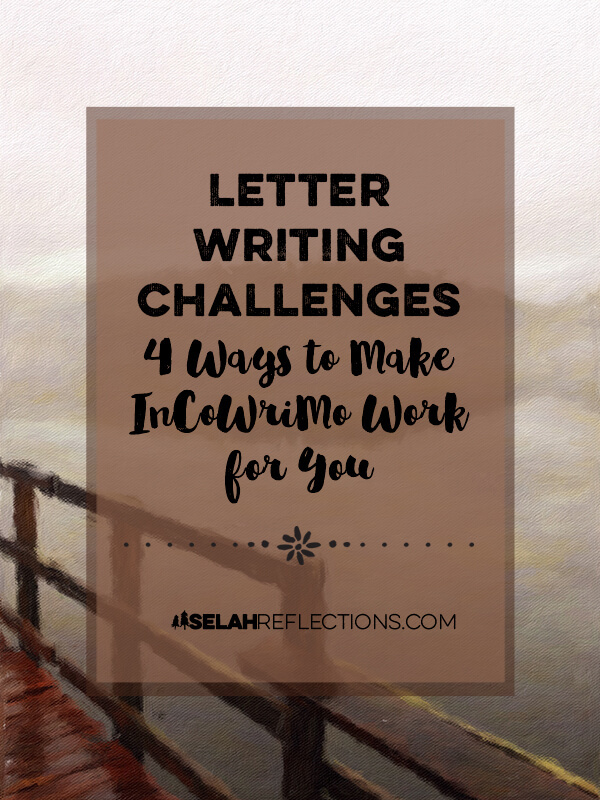 Today, I’d like to share three simple ways to make a letter writing challenges like #InCoWriMo work for you. I wrote more in-depth about “Learning to Pick Your Battles” here. The idea is that no matter how excited you are about taking on a new commitment, you need to ask the question, “Is this the best time to take it on?” As a fellow creative, I completely understand the idea of getting swept away by the challenge, the uniqueness of an opportunity and the runaway thoughts of people to write to, stationary you could create and more. I’ve learned over the years to let my brain and imagination have some fun with a new idea. I have a spot in my planner for brainstorming ideas. It’s fun to allow the ideas flow and see the potential and what all is involved. This list usually shows me fairly quickly whether or not this is the right time to take on that project. If it’s not the right time, now I have all the ideas captured and saved so I won’t forget. Personally, I know that once I get to day three or four of a challenge like this, on top of everything else on my plate, I would fizzle out. The letters won’t get written, or they will not match the vision I had at the beginning of the month that I would be disappointed. I will be writing letters and cards this month, quite a few actually but not 28! This month alone I have seven birthdays of friends and family members. When you also add in that, I write my Compassion kids once a month that is already nine letters and cards. When I look at that list, I know I can do that! Some cards or letters will be short, others will be more involved, but two a week rather than seven? Yep, I can do that. There’s no hard and fast rule that says you HAVE to follow a challenge like this to the letter. The point is to connect with people and have some fun. If you take a look at my Pinterest board here or here on Instagram, you will see all sorts of letter writing prompts, envelope ideas, creative packaging, and more. I could spend hours getting lost in the creative ideas of others. The reality is, however, again, I don’t have time to go that crazy. While I do love using great writing paper and writing with my favorite pen (okay, well pens I can’t always choose just one favorite), sometimes simple lined notebook paper, the pen from the junk drawer and a plain white envelope is all you need to make someone’s day! Letting someone know that you care about them and have been thinking about them, is far more important than how fancy the paper you are using is. A challenge like this also makes you feel like you have to fill in the entire notecard, top, bottom, and back. But you know what? You don’t have to, and the receiver is not usually expecting it either. Pick smaller notecards or a half sheet of paper instead of a full size. It makes a difference, ask me how I know. Knowing you have limited space and that the smaller card will only take you a few minutes to write in, makes it much more likely to happen. No matter if you are participating in a letter writing challenge or just have a lot of birthday cards to send out this month, getting your supplies organized up front makes it so much easier for you later on in the month. Favorite writing pen: Or if you are like me, a favorite bag of pens! Colored pens, felt tip, or ballpoint, it all depends on the writing project for me. And if I’m TOTALLY honest bags (plural) of pens. I uhm, really like colored pens of all sorts, types, and styles. Selection of notecards or stationary: Blank cards are my favorite, and with all the photography I do, I usually make a batch of photo cards to have on hand. But there are occasions when having a special birthday card or thinking of you card with the perfect verse inside is just what you need. List of names and addresses: Create a plan of who you would like to write to this month and list out their names, addresses that you can easily find. Over the years most of the people I write to are on my phone which makes it quick and easy to pull up their mailing address. If it’s not quick and easy the card will sit there until I remember where I put my address book. Stamps: I always try to have a book of stamps handy, otherwise again, it will sit there until I remember to get to the post office and buy more. Extras: Years ago I bought a set of envelope templates and grabbed a bunch of old magazines and made way too many envelopes. I still have them years later, but I do have them and have been making a point to use them lately. They are cute and fun to use. My sticker collection gets pulled out for letters too. I am not the worlds best sketch artist, I have trouble with stick figures sometimes, but stickers? You peel them off and add them for some fun color and style. And then there is Washi Tape… Remember, these are all optional and not at all necessary. Will you be participating in any challenges this month? Oh, this is so great, Marta. Recently, I’ve had a tug in my heart to write more letters…and maybe send a few care packages! I would certainly fizzle out on just about any challenge right now, but this article gives some good ideas and fun resources. Looking forward to hearing how it goes for you! Last night I made enough photo cards to get me through the month and mailed off my first card, and hand delivered another one. So far so good :).